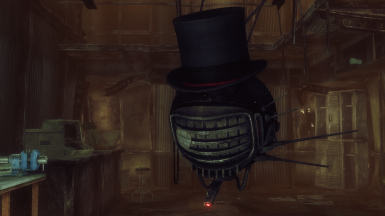 A fancy eyebot follower with a top hat. 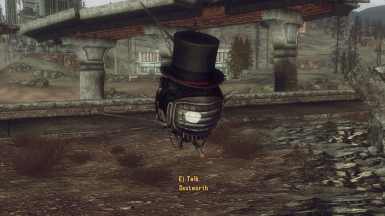 If you want to use this eyebot in your mod, he was originally released as a resource here. Take the mesh from there and you'll be good. Hello everybody! 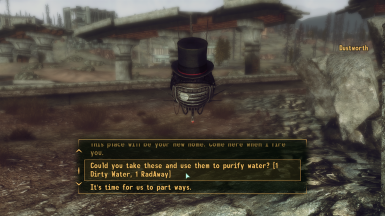 This small mod adds an essential, fully-voiced eyebot follower to Springvale. 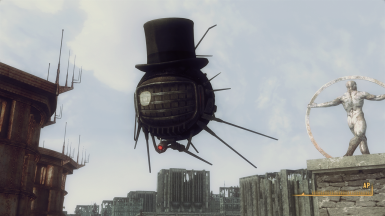 His name is Dustworth, and he wears a top-hat and monocle. Also available for Fallout: New Vegas! 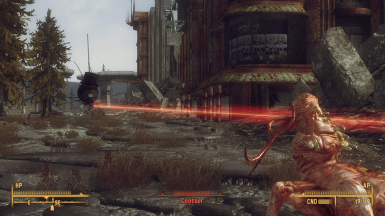 The mod has been cleaned with FO3EDIT and does not require any DLC, so it should be safe for everybody to use. Still, you should always make a backup save before installing ANY mod, in case something goes wrong. A very simple eyebot follower, Dustworth has a few extra features: if you give him some dirty water and radaway, he will give you two bottles of purified water once a day. He (obviously) follows, waits, trades equipment, and leaves. You can repair him with some wonderglue if his health is down, and give him a custom home marker if you want him to stay somewhere else while he is not following you. Your new best pal Dustworth was voiced reusing existing vanilla lines, and will not increase your follower count. You will get a simple perk ("Behatted Robo-Buddy") when you hire him, which will increase your Speech by 5. Springvale, near the gas station. He may be hopelessly bumping against the Megaton sign when you get there, bless him. To install, extract the contents of your downloaded file to your "Data" folder. Then activate the mod through your preferred launcher by ticking the checkbox next to the esp. Or you can use your mod manager of choice to download the mod automatically. To uninstall, simply delete the files from your Data folder, and you're good to go. - I hate [thing] and [thing] and [thing]! You should have done [thing] and [thing] instead! And while you're at it remove [thing] and [thing] and add [thing] and [thing]! And [thing] is NOT LORE FRIENDLY! FIX THIS! - I hate the dumb perk! I don't like the location!! CHANGE IT!! - Is this compatible with [mod]? - Dunno. The mod was made not to touch a single vanilla thing besides the cell where Dustworth is. If you spot any compatibility issues, let me know so I can list them here. - The mod is awful/glitchy/buggy/etc. I am going to uninstall it and I must let everybody know!